Japan and Poland were booed from the pitch in Volgograd after a farcical end to their final Group H match which saw the Blue Samurai qualify for the last 16 despite a 1-0 defeat. Japan went through by the slimmest of margins — their fair play record — after the last 10 minutes were played out like a training match as both sides settled for the result. They will meet either Belgium or England after reaching the knockout stage for the third time in their history. When Jan Bednarek scored his first international goal in the 60th minute for already eliminated Poland, the score between Colombia and Senegal stood at 0-0 meaning Japan were going out. But once news filtered through of Yessy Mina’s 74th minute goal for Colombia the match changed for the worse. The strike meant Colombia would win the group and Japan were ahead of Senegal despite identical points, goal difference and goals scored, because they had received fewer yellow cards. Japan coach Akira Nishino made six changes including bringing in attacking pair Shinji Okazaki and Yoshinori Muto for his World Cup debut. And it was they who fashioned the first real opening in the 12th minute of a game played at sedate pace in 36 Celsius temperatures. Bednarek played a blind pass across his penalty area straight to Muto who shifted it to Yuto Nagatomo motoring down the left flank. His whipped cross was met by a diving Okazaki header which flashed wide. Moments later Muto won possesion again outside the box and his fierce shot was parried out of harm’s way by goalkeeper Lukasz Fabianski, one of five changes in Poland’s starting line-up. The Polish captain Robert Lewandowski is renowned as a world-class goalscorer for Bayern Munich but, as in the rest of Poland’s sorry World Cup campaign, he was seeing little of the ball. 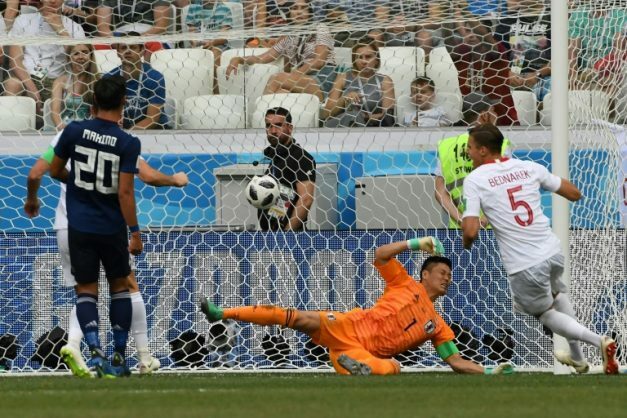 Goalkeeper Eiji Kawashima kept his place for the Samurai Blue despite a howler for Senegal’s first goal in the 2-2 draw and repaid Nishino’s faith with a wondrous save to keep the score goalless at half-time. Piotr Zielinski crossed from the right and Kamil Grosicki found himself unmarked near the penalty. Goalline technology confirmed he had kept it out by less than half the width of the ball but that was just about all Poland had offered as they headed for the shortish plane ride back to Warsaw. Kawashima did it again in the second half to prevent what would have been Tomoaki Nakino own goal. Okazaki had run his heart out in the sapping conditions and gave way to Yuya Osaka in the 47th minute as Nishino introduced fresh legs. Kawashima did have to pick the ball out of his net on the hour mark as Bednarak got on the end of a Rafal Kurzawa long free-kick to volley home at the back post.